Should You Skip MBA to Start a Business in Bangladesh? The question is about the business venture that should you skip MBA. Or, it must be achieved to start a business in Bangladesh. Although a professional degree will get you only so far, people think an MBA is essential to be g success business entrepreneur. They’ll tell you that an MBA is only useful if the business is up and running and not during its inception when you ask any MBA about how their degree helps in running a business. What the most useful of an MBA is when the business is up and running and not during its inception. Besides, an MBA will be able to execute a business plan effectively that’s not a verse of the Bible. Because it’s something that is not dealt with in the curriculum of most B School, MBAs do not have a clue about how to start a business from the grassroots. However, they’re able to execute various strategic business plans, can’t work with an idea into a proper functioning business. The use of unique mindsets and skills instead of executing tried and tested business plans is the central focus of the early stages in all start-ups. Also, discovery and execution are the most important among all the stages of entrepreneurship according to studies. When you need to build a start-up, an MBA can’t help you. If you want to survive in the unstable environment of a start-up, you’ll have to learn how to make a business plan. It’ll be a new challenge every step that you take as an entrepreneur. 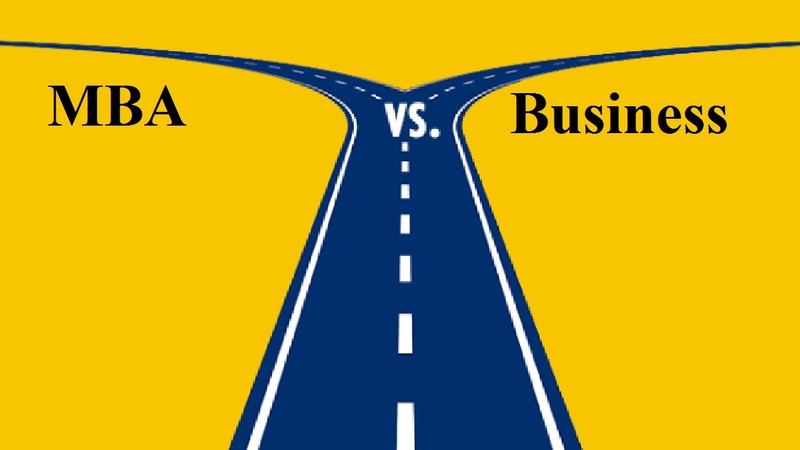 Why Should You Skip MBA at the Stating of your Business? We can come to a conclusion that MBAs will not help you start a business from anything as we have discussed the different aspects of business with and without an MBA. Also, it’s already said that when you’re well set, it’ll definitely help you gain momentum and maintain your business. Now, we’ll know some points that will help you to decide should you skip MBA or not. If you have the right skills and a great idea with innovative and of the highest creative energies you don’t need an MBA. The products or services might open up your business when you know how to tap into the market. You’ll surely have an advantage if your idea is the first mover in the market. Because of this, your initial market will be near monopoly until your competitors tap into the same market segments. This is one of the great reasons why should you skip MBA for a business startup in Bangladesh. In order to form a great team of leadership, there is not any specific training. So, what you have to do is that you must find the right people who have the domain-specific knowledge and help you understand your business better. As a result, an MBA is useless here and this is one of the big reasons why should you skip MBA for a business startup in Bangladesh. If you want to take the brunt of risks on yourself, an MBA doesn’t prepare you for that. So, when you want to start a business amidst all the uncertainty and survive, you need to be audacious. Also, you must survive until you make your business stand up to the competition. Although a start-up is a completely different story, an MBA will help you manage risks or avoid unnecessary risks. That’s the reason why you need to jump right in and give your best shot to raise capital. This way you can create a market for yourself and also have backup plans in case your business fails. If you want to take your business from ground zero to level one, passion and perseverance are the two most important things you need. While passion and perseverance help you treat your startup like your own child, an MBA will help you understand businesses as a system. Nothing can stop your business on the map and it’s the point that an MBA school don’t teach. After a long debate of the point that should you skip MBA to start a business in Bangladesh. It’s true that an MBA can help you understand businesses better, but it is definitely not necessary. This is because you know better about your business and your own. So, an MBA becomes irrelevant when you gain the right knowledge through experience. But, we or nobody can claim that an MBA is entirely useless. We’re talking about the startup stage of your business venture. An MBA is one of the great assets in the business world. So, it can take your business at the top like Google’s Search Engine Result Page’s first page. An MBA is similar to the Search Engine Optimization where sites are taken to the top of the search. In the same way, MBA holder will take your business at the highest success. That’s a good ability to handle business plans after they have been created and understanding concepts. But, an MBA is definitely not necessary when it comes to starting up a new business. Your business will require it when all start-ups will grow. As the real experience is the best degree, it’s the great reason why should you skip MBA to start a business in Bangladesh. It doesn’t mean that we’re declined an MBA because you can receive a well-rounded education that can help you to launch a successful business with an MBA. It teaches how to manage a team, understand business specific finances, and research the best business plan etc. but, the same thing is coming back to say that the practical experience is the “Boss”. It’s the winning concept to be a success in your business.